Sometimes things are just not meant to be. As all filmmakers out there know, something always goes wrong – always. I don’t like to give up, but I have to admit that occasionally, there really is no saving the day, but often times, if you just keep fighting and working on the problem, serendipity will intervene, and maybe even improve on the original plan. So here’s a brief story about perseverance across three continents – a high octane half hour stretch to coordinate an interview that just was not meant to be – but all because something emerged that was even more amazing! DocHouse recently hosted a screening of Red Lines in London. They are a terrific group and did a great job organizing the event, even coordinating a Skype call with Razan in Antakya, Turkey. Skype had been tested, tickets were selling well, and it looked like the event would go off without a hitch. Ha! Little did we know that events of much more importance were swirling around us. The Red Lines screening just happened to fall during the Jewish New Year, Rosh Hashanah, and Red Lines director Andrea Kalin was observing the holiday in synagogue in Washington, DC while across the Atlantic the event in London began. Forty-five minutes later, the phone started vibrating in Andrea’s pocket. She went to turn the phone off (and probably should have had it turned off already since one is supposed to be untethered during the High Holidays), but just before powering down, she saw the message from Mouaz – Razan is on the border and her phone is about to die. How can she do the Skype call? Huh? We thought Mouaz was in Washington, DC! What was he doing in Turkey?! And why was Razan on the border? The film is already half way over in London…that did not give us a lot of time to come up with a solution. Andrea stepped outside. Discreetly sending text messages to Mouaz for more information while also dispatching messages to the DC Spark office, Andrea had to figure out some sort of backup plan. But another problem was how to get that backup plan to London?!?! DocHouse offices were closed because everyone was attending the screening. So far as they knew there wasn’t even a problem! And in about a half hour, they were going to call Razan on Skype and in front of a crowded movie theater, but no one was going to answer. We got lucky that someone from DocHouse just happened to look down at their phone and notice the email we had sent in a panic! So now we had all the players involved in finding a solution. But why the heck were Razan and Mouaz on the border anyway?! “My phone is now dying, too.” Are you kidding me?! “But iPad in hotel. Rushing there now.” Okay, that’s helpful. Clock is ticking. Hurry up. “Use Mouaz’s Skype.” Good solution except we lost time because auto correct turned Mouaz’s Skype name into PeoplePuaz…so we lost more time trying to find this mysterious PeoplePuaz person who didn’t exist. We finally got the right Skype name, and DocHouse and Mouaz found each other just before the film ended. Mouaz and Razan, accompanied by members of Congress, were on mission to broker a deal between more than 20 moderate Syrian battalions to ally against both the Assad regime and ISIS. 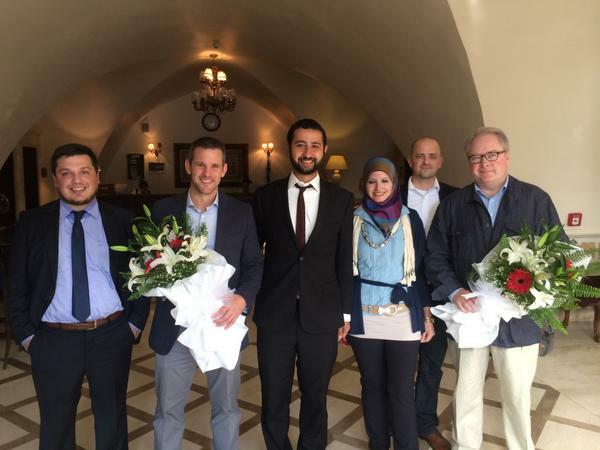 This included an alliance between Muslim and Christian opposition groups. CNN called it a historic agreement. The film ended in London and there was enthusiastic applause. 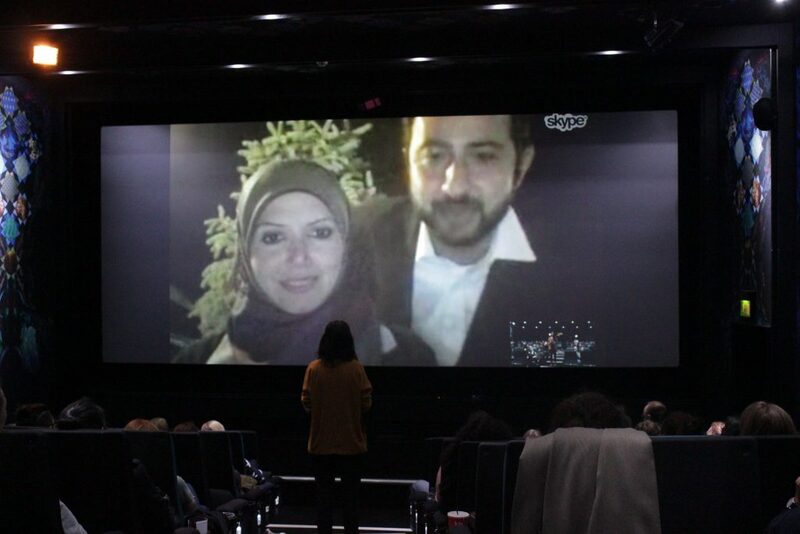 The Skype call started…and both Razan and Mouaz answered. Not only did a very lively discussion take place about the Syrian revolution, but Mouaz and Razan actually announced the deal they had just helped broker to the audience – which was just a complete thrill for the audience. And then U.S. Congressman Adam Kinzinger popped onto the Skype call to say hello and answer one or two questions about U.S. policy. WOW. This was not your usual film screening Q&A. It was quite a show, and DocHouse said it was one of the most engaging post-film discussions they’ve ever had. And to be able to get that type of groundbreaking news from the front line of the conflict before the media got their hands on it…amazing. Serendipity. Some things are just meant to be. Even when they aren’t!